Cars Above, Barges Below. 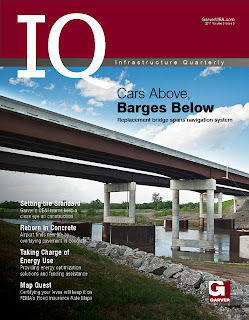 Improving a State Highway 51 bridge in Wagoner County, Oklahoma required designing for two modes of travel: highway and waterway. The bridge crosses the Verdigris River, which is part of the McClellan-Kerr Arkansas River Navigation System. Setting the Standard. Garver's CE&I teams are expanding and keeping a close eye on construction. Reborn in Concrete. Sulphur Springs Municipal Airport in Texas is finding new life after overlaying its aging airfield pavement in concrete. Taking Charge of Energy Use. 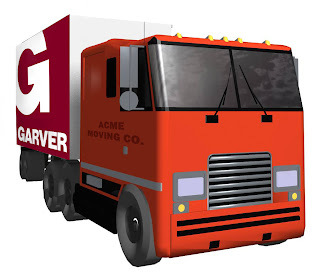 Proactive utility owners are making energy use more efficient at their water and wastewater treatment plants, and Garver is helping by providing energy optimization solutions and project funding assistance. Map Quest. Certifying your levee will keep it on FEMA's Flood Insurance Rate Maps. Garver is working with communities to certify and provide evidence that levees meet current design, construction, maintenance, and operation standards. You can read this issue and past editions on our Website. 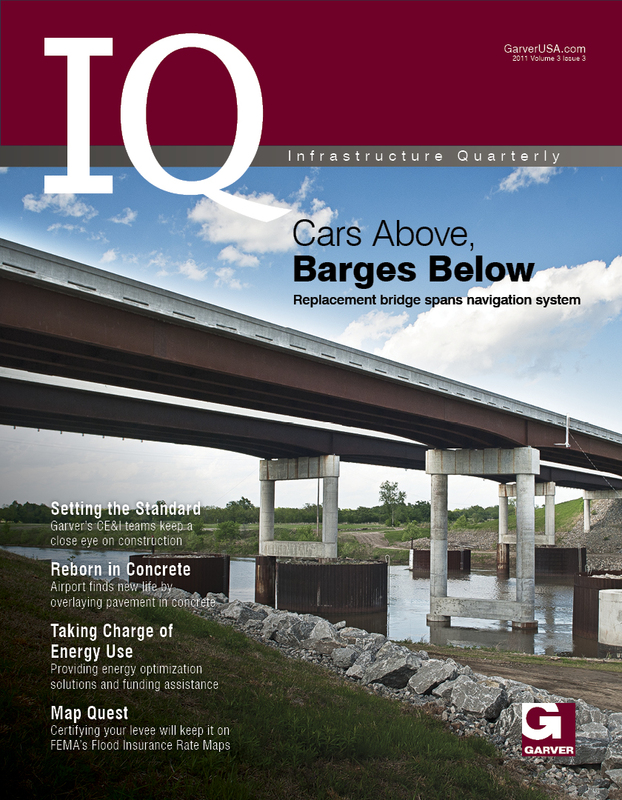 Is there a project you'd like to see featured in IQ? With a wild look in their eyes and an unbending determination to conquer the extreme, Garver's Steve Jones and Kyle Kruger recently pushed themselves to the limit across brutal mountainous terrain. 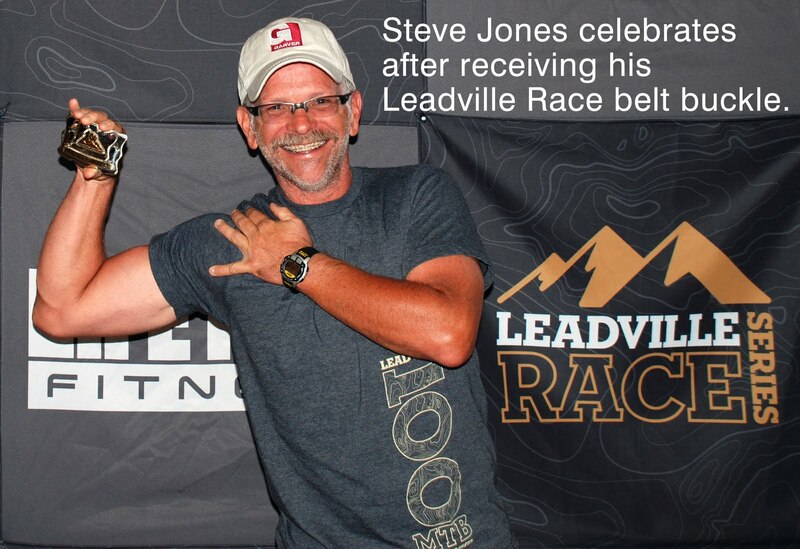 Nicknamed the Race Across the Sky, Steve and Kyle tackled the Leadville Trail 100 Mountain Bike Race in Colorado on August 13, a 100-mile course in the Rocky Mountains. With 15,000 feet of total climbing and an ultimate high at Columbine Pass (12,424 feet above sea level), the race features forest trails and mountain roads, steep climbs and narrow descents, sharp turns and switchbacks, creek crossings, and panoramic views. With an entry field of over 2,000, less than 1,300 finished. With arms raised high as he crossed the finish line, Steve completed the race in 11 hours and 39 minutes. 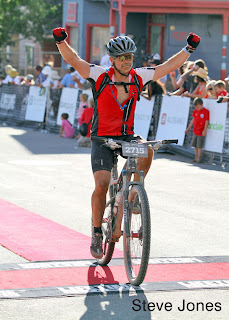 Steve started near the back of the pack but passed nearly 1,000 riders to finish. Pushing hard to the finish, Kyle completed the course in 11 hours and 58 minutes. Kyle overcame several challenges during the race to finish ahead of the 12-hour cutoff. 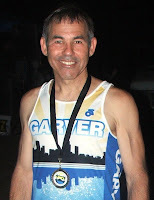 This was his second time to complete the race; in 2008, he finished in 10 hours and 17 minutes. 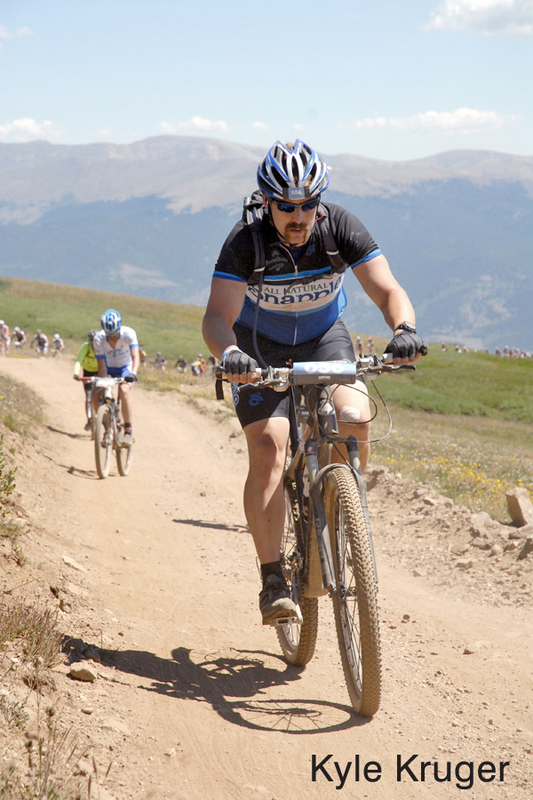 This wasn't Kyle and Steve's first experience together with long-distance mountain biking. Last year they rode with a Garver group (including President Brock Johnson, Chief Operating Officer Dan Williams, and Chief Marketing Officer Chad Clinehens) on a challenging seven-day, 215-mile hut-to-hut adventure from Durango, Colorado to Moab, Utah. Have you ever biked in a 100-mile race? A map and driving directions are located on our website. The office phone and fax numbers remain the same. 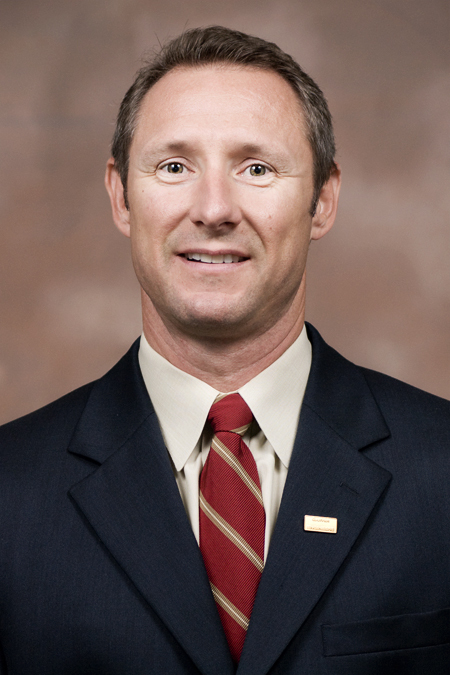 Brent Schneirs, PE has been instated as an officer on the American Council of Engineering Companies Oklahoma Board of Directors. Brent is serving as the 2011-2012 Vice Chair - Business Practice. Last year he served as the Vice Chair - Education/Public Relations. 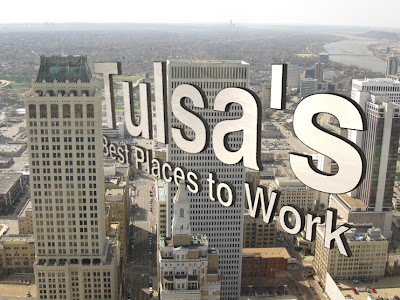 Brent is Garver's transportation team leader in our Tulsa office. 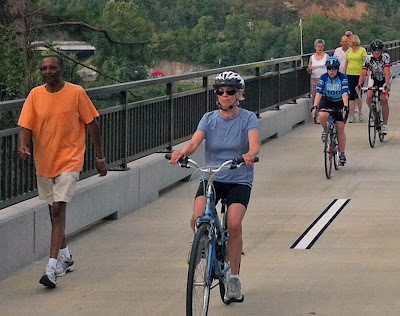 More than an hour before the Garver-designed Two Rivers Bridge opened to the public at 7am on July 23 in Little Rock, Ark., over 200 enthusiastic bicyclists and walkers stood in line to celebrate the event. 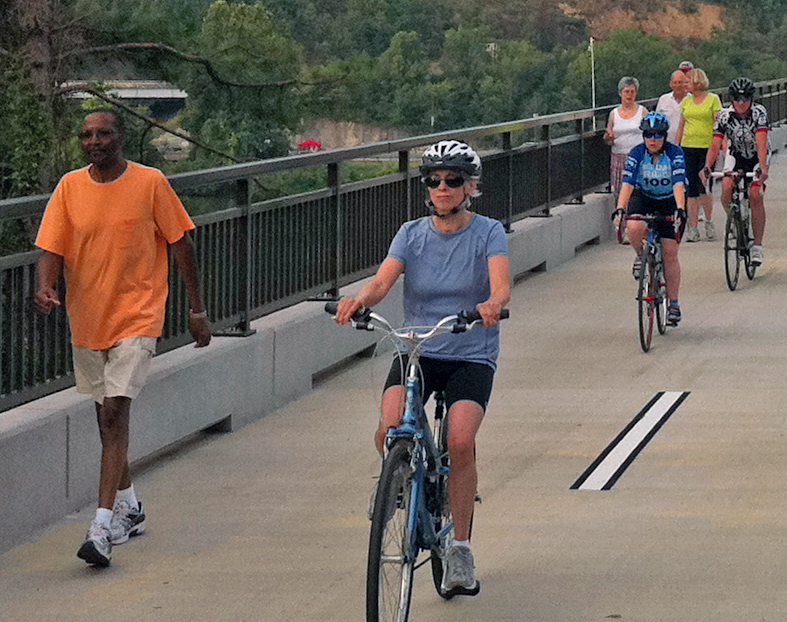 The pedestrian bridge connects the Arkansas River Trail with Two Rivers Park and provides 17 miles of uninterrupted trails. The 1,760-foot-long bridge sits nearly 40 feet above the river's high-water mark and is 14 feet wide. 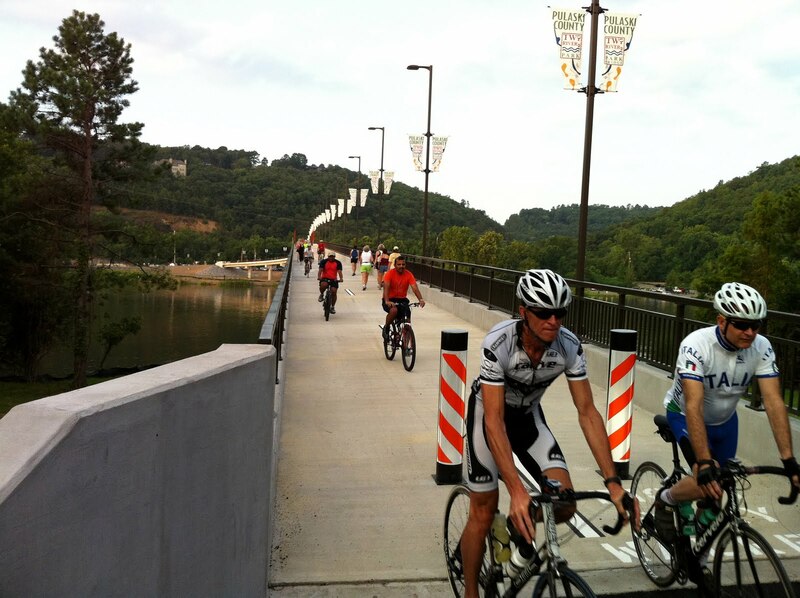 This year's Big Dam Bridge 100 bike ride (September 24) has a new route for the 100-mile course that includes the Two Rivers Bridge. 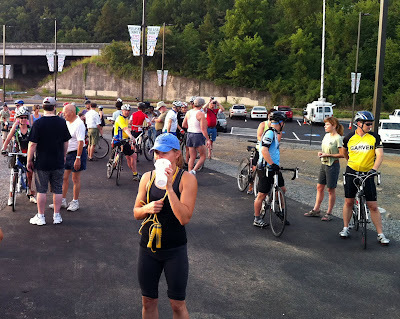 Register for the ride. Transportation Director Bert Parker attended the opening and took pictures. 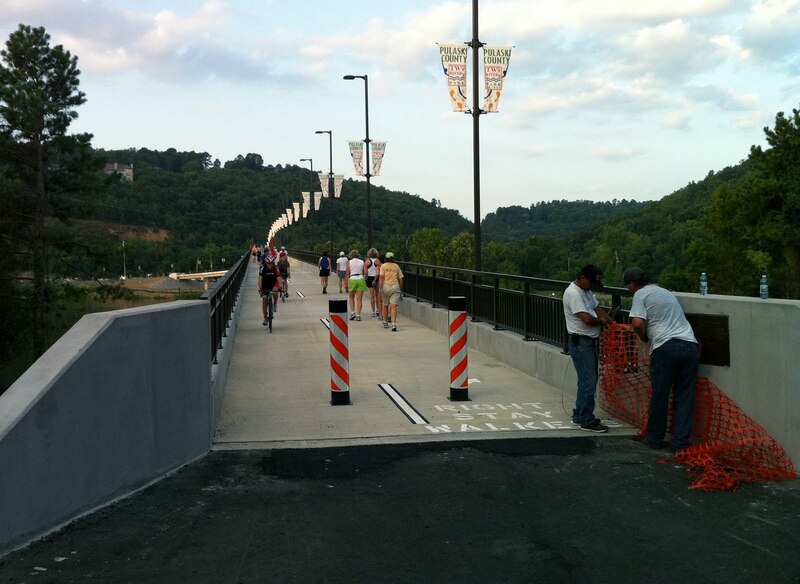 Workers remove the temporary barrier, allowing access to the bridge and its trail system. The bridge remained busy for many hours. Both walkers and bicyclists turned out to enjoy the beautiful morning and be some of the first to cross the bridge.